Zion National Park is love at first sight,” Kacey Jones explains, “and it’s had my heart since my first visit as a third grader.” Kacey serves as the Assistant Director of Development at the Zion Forever Project and loves to find pathways for people to partner with the park. Entering her 20th year as a qualitative researcher, Kacey started her career in the field documenting the impact of a USAID-sponsored scholarship program for elementary-aged girls in Guatemala. 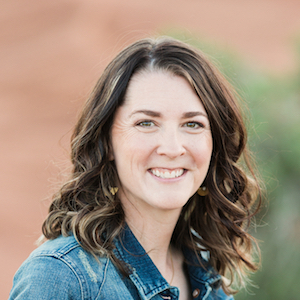 She has lead research projects that told the story of female veterans accessing VA health care in rural Utah, and shared the experience of families participating in community gardening and literacy programs in Mali, West Africa. A grant writer and program designer, Kacey teamed with Tribal College faculty and students to build STEM culture at Chief Dull Knife College on the Northern Cheyenne Reservation, securing long-term funding from the National Science Foundation and NASA. Kacey and her husband Will enjoy taking their children Zach, Kate, and Matthew on adventures. They love to travel, hike, and spend time outdoors.